It's a shame they don't make classic films like 'Harvey' and 'Arsenic and Old lace' anymore. 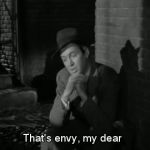 That's envy, my dear there's a little bit of envy in the best of us. That's too bad Isn't it.